Originally named Bon Sejour, Oak Alley was built in 1837-39 by George Swainey for Jacques Telesphore Roman, brother of Andre Roman who was twice governor of Louisiana. Joseph Pilie, Jacques Telesphore Roman's father-in-law, was an architect and is thought to have provided the design of Oak Alley. Oak Alley's most distinguishing architectural feature is a full peripteral (free-standing) colonnade of 28 colossal Doric columns. Such plantation houses were once scattered along the Mississippi valley, though Oak Alley is probably the finest of those remaining. In 1866, Oak Alley was sold at auction to John Armstrong. Several owners followed Armstrong, and by the 1920s, the house was is in a state of deterioration. Andrew and Josephine Stewart purchased the property in 1925 and hired architect Richard Koch to conduct an extensive restoration. The pale pink of the plastered columns and walls and the blue green of the louvered shutters and gallery railing were color choices of Mrs. Stewart at that time. Square in plan, the interior has a central hall from front to rear on both floors. At each end of both halls the doors have broad fanlights and sidelights framed with slim, fluted colonnettes. Rooms at the first floor rear were partitioned and adapted to modern uses at the time of restoration in the 1920s. Equally significant is the impressive double row of giant live oak trees which form the oak alley, about 800 feet long, from which the property derived its present name. Planted before the house was constructed in 1837, this formal planting is a historic landscape design long recognized for its beauty. An important event in American horticultural history occurred in the winter of 1846-47 when Antoine, a slave gardener at Oak Alley, first successfully grafted pecan trees. His work resulted in the first named variety, Centennial, and the first commercial pecan orchard at nearby Anita Plantation. Josephine Stewart established a nonprofit organization to manage Oak Alley after her death. This Greek Revival showplace is now open to the public for tours. 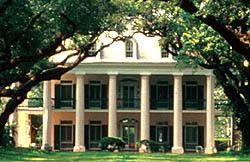 Oak Alley Plantation, a National Historic Landmark, is located on 3645 State Hwy. 18 in Vacherie. Fortunately, the house was not damaged by Hurricane Katrina, but please check with them directly to confirm the current hours of operation. Oak Alley is normally open daily 9:00am to 5:30pm from March-October and 9:00am to 5:00pm from November-February. Tours are available for a fee and groups are encouraged to call ahead. Call 1-800-442-5539 or visit the website for more information.